24 Hours Blogging!..... : Aamir Khan is Vadivelu’s fan! “I don’t have fan clubs. Each and every family is my fan club. Their ration card is the ID card of the fan club”, says Vadivelu, who enjoys being the most lovable comedian of our times. 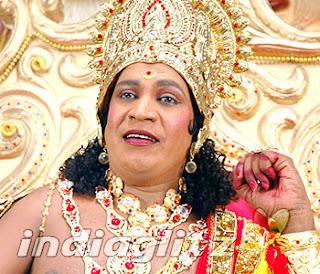 Vadivelu, who met the media persons in a press meet organised on January 28, informed the reporters about his new fan. It is none other than Bollywood superstar Aamir Khan. The distinctive actor has the habit of relaxing himself amidst hectic work schedule by viewing Vadivelu’s comedy scenes. Mind you, Aamir doesn’t know Tamil but that doesn’t prevent him from enjoying the amazing facial expressions and hilarious body language of the comedian. Aamir Khan has shared this information to Murugadas, who directs his Gajini in Hindi. Even censor board members have become his fans. The officers, after seeing his ‘Indiralogathil Na Azhagappan’ have appreciated him for his awesome performance in three different roles in the film. The film has been given U certification. The leading comedy actor is quite excited about his forthcoming film ‘Indiralogathil Na Azhagappan’ that is to be released on February 1. He is confident that the people would appreciate his and the team’s hard work.